Cashew production is an increasingly important source of revenue for small farmers in the Senegambia sub-region. However, there still remain untapped opportunities for increased revenue and household food security that stem from massive amounts of cashew apple left to waste. It is estimated that 55,000 tons of cashew nuts were produced in Senegambia in 2015. As the apple constitutes about three quarters of the entire weight of the cashew, approximately 165,000 tons of cashew apple was produced in Senegambia in 2015. Less than five percent of the apple was used, mainly to produce cashew wine. Farmers expressed concerns about food availability and the potential of the cashew apple to be used for something more. To address this concern, a five-day training workshop was organized in which 18 participants learned nine recipes appropriate for rural household preparation and consumption. The recipes included dried cashew apples, cashew apple jam, preserved sliced cashew apples, cashew apple cake, cashew apple fitters, cashew apple kebabs, cashew apple stew, cashew apple enriched baby food and fresh cashew apple juice. The participants quickly shared this knowledge with peers in their communities, and seven follow-up training sessions were conducted for another 65 participants. One group, Juboo, used their cashew kernel drying oven to produce enriched baby food. This product was very popular in the community and approved by personnel of the nearby community health center who were invited to inspect the production process. 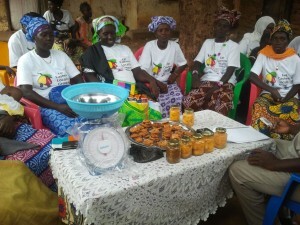 The enriched baby food is especially effective in rehabilitating malnourished children and will provide a viable market opportunity as the malnutrition rate in the North Bank Region is quite high, estimated at 12 percent in 2010. As more farmers are trained in cashew apple processing, accessibility and food security will increase in the region.